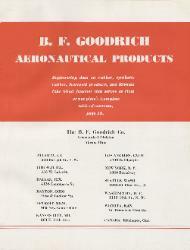 1944 The B. F. Goodrich Co.
product catalog for The B. F. Goodrich Co. It is 16 pages. smooth bore allows a maximum flow of air. Sizes below 6"
furnished in long lengths unless otherwise specified. Sizes 6"
synthetic rubber, inner cotton braid and asbestos outer braid. CAAA AO-19." Max. length, 50 ft."